Forget about spring cleaning, how about spring improving with renovation and design projects? And if you’re one of the 53% of homeowners who agree now is a good time to renovate a home, you’re right! 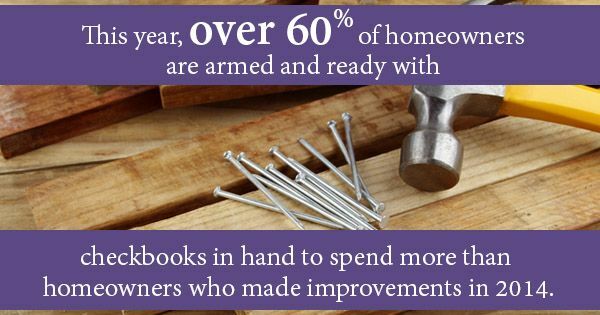 This year, over 60% of homeowners are armed and ready with checkbooks in hand to spend more than homeowners who made improvements in 2014. Spring is a time of renewal and this mentality can also be applied to your home. In fact, more and more homeowners are choosing to improve their homes in order to beautify them and add value rather than moving. For example, did you know that even minor home renovation and design projects such as a small kitchen update can yield a return on investment (ROI) of up to 73%? However, trends and house renovation design ideas come and go similar to the way fashion trends go in and out of season. As such, it can be difficult to combine your personal style and tastes regarding home renovation and design with what’s hot and what’s not. Here are just a few ways you can combine some of the latest trends in home renovation and design with your own tastes to get the results you want. Many of the top home renovations are in the kitchen, and this year, some of the most unique home renovations are in the kitchen as well. “Hand-less” kitchens have become all the rage this year, featuring sleek, streamlined, and sophisticated silhouettes. Manufacturers are using several innovations to eliminate the need for handles on appliances, cabinets and faucets. However, this modernist aesthetic, while appealing, maybe a bit too harsh or Spartan-looking for some. Try combining hand-less features with traditional accents to balance both old and new. Bold, bright accent walls in highly saturated and pigmented paint colors are so last seasons this year. Instead, homeowners are leaning towards softer, powdery pastels. These colors are especially helpful if you’re trying to sell your home. Soft shades of neutral tones such in olive green, browns, blues, lavenders, and more are being sought. However, if you like things on the brighter side, try adding bold, colorful accents to balance things out a bit. 2015 is the year to reduce, reuse, and recycle old items for raw material. For example, old wood that can re-purposed to become furniture or flooring. Or using an old cast iron bathtub as part of your landscaping. It’s common to pair these antique items with modern accents. To add your own personal touch, use old furniture, fabric, and material such as old metal and turn it into something new!